Acne is an extremely frequent dermatological condition given that it affects nearly 80% of adolescents. In 20% of cases, it presents in a moderate to severe form. Known for occurring when approaching puberty, acne generally spontaneous heals around the age of 20 to 25. However, for black and dark skin, the onset of acne is delayed to the age of 16 to 17, and the duration is prolonged to the age of around 25 to 30. 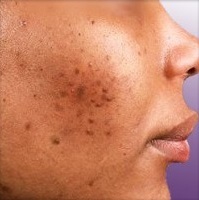 Acne is therefore not a skin condition uniquely affecting adolescents. It’s prevalence in adults, estimated at around 40%, is increasing. You can also read our Beauty Tip on this subject. The lesions and pimples are localised in those zones which are richer in sebaceous glands, which are the face, the back, the neck or the chest.